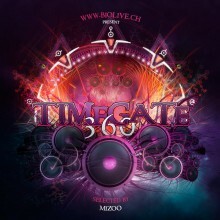 For the 9th edition of their “Timegate” NYE festival in Switzerland, Biolive is proud to present “Timegate 360”, a compilation featuring Swiss and International artists. An ambient debut with mnnsk & mizoo followed by a progressive turn by Flow Box, Loud and Ghost Rider leading to a psytrance flight with Attik, Waio and Middle Mode and an atmospheric epilogue by Solar Fields and AES Dana. Selected by Cyril Miserez aka Mizoo, a passionate dj since 1992. Mastered by Vincent Villuis aka AES Dana at Ultimae Studio. Enjoy the Music!